Boyfriend and I were able to put our E-book to good use again. We’ve only used it twice, and already the book has paid for itself. We ordered one of each of the two available choices. Boyfriend had the 1/4 chicken (aka. chicken breast) and I had the double-leg as I always thought chicken breast is too dry. Even with a good place as Nando’s, it’s still the same. They give you 4 choices of spiciness. I picked the Lemon & Herb one which is the bottom of the scale aka. not spicy at all. Boyfriend had the Medium. The legs were great, albeit a bit skinny. The flavor was all throughout the meat and the skin was crispy. It was very good. You can see that they also provide extra peri peri sauce. Even though they had different names, I thought they tasted the same. Just the spiciness level is different. 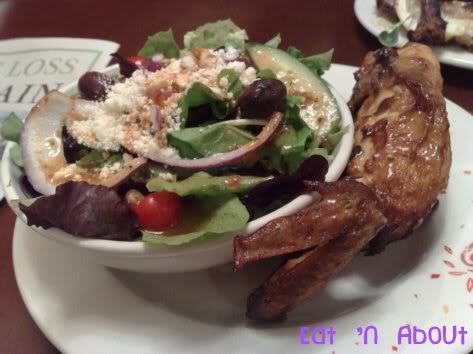 We also appreciated the size of the included side salad. It was quite large. There were a few choices to choose from. 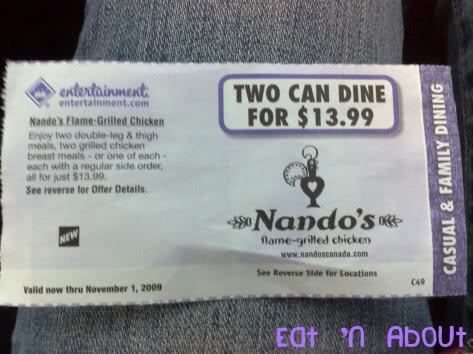 Without the coupon, the meal would’ve cost $18.48 ($9.49 for the double-leg meal, $8.99 for the 1/4 chicken meal). So this was definitely a good deal. I’ve also found in the Georgia Straight papers, the same sorta coupon, but the price is $14.99. Still a good deal. LOL. I used my coupon a month ago too. 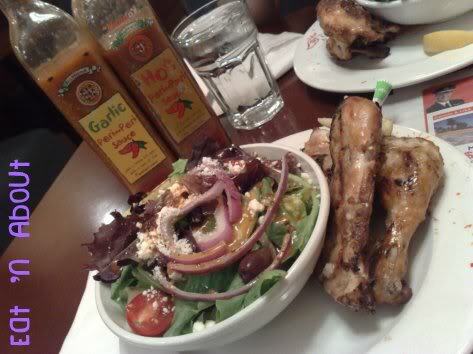 About the Peri Peri sauce. I agree, it all tastes a bit spicy and vinegary. Can’t really tell them apart. I love Nando’s. I can always count on flavourful bbq chicken with the hotness that I crave in my food. While the 1/4 leg chicken is what I usually order, I sometimes feel like eating the chicken wings on a skewer which is also good. There’s more grilled char flavour. I also enjoy their fresh mediterrranean salad which I usually ask for extra nuts/seeds, and they’re happy to accommodate me for no charge.